Biological Activity: Active with various fluorogenic peptide substrates, including FLUOR DE LYS® deacetylase substrate (Prod. No. BML-KI104) and FLUOR DE LYS®-SIRT1 deacetylase substrate (Prod. No. BML-KI177). Specific Activity: ≥1 U/µg. One U=1 pmol/min at 37°C, 100 µM, FLUOR DE LYS®-SIRT1 deacetylase substrate (Prod. No. BML-KI177). Scientific Background: HDAC6 is a class II HDAC, a group defined by its member’s homology to the yeast HDAC HDA1. It is unique among human HDACs in that it contains two full deacetylase domains. A tubulin deacetylase, HDAC6 may act to promote autophagic clearing of huntingtin aggregates and retard HIV1 infection, but also to promote invasive motility in tumor cells. 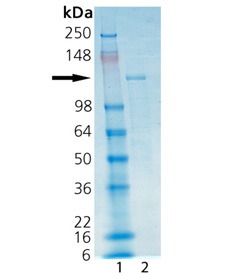 SDS-PAGE analysis: Lane 1: MW marker, Lane 2: 2µg HDAC6.